Last one from the family of creational patterns is Object Pool. The main purpose of object pool and why designers choose to incorporate to the software is a performance boost. Construction and destruction of object can become very expensive operation in some cases (especially if it occurs very often). Constant building and throwing away instances may significantly slow down your application. Object Pool pattern offers a solution to this problem. Object pool is a managed set of reusable objects. Clients then “check out” objects from the pool return them back when they don’t need them any more. But it’s not that easy as it sounds. The manager of the pool has to deal with various problems. What happens if the pool is empty and a client asks for an object? Some implementations work with growing pool of objects. That means if there’s no object available at the time of the request the pool manager creates one more. The manager can also destroy objects periodically when they’re not used. But what was the initial goal? Performance boost? Well, with this amount of overhead it might not be as fast. Another solution to the problem is simply to decline a client’s request if the pool is empty. This also slows down your system, because clients needs to do things right now and not wait for someone else to free up resources. The other problem is dealing with errors. Every client must explicitly free up the resource when he’s done. But programmers are also only humans (well, in most cases) and there will be errors and your pool can easily become a hole full of zombies. So you might need to implement an algorithm for detecting and freeing expired reservations on resources in order to make stuff work properly. Multi-threading brings into the game a whole other aspect. Two processes asking for resources at the same time. Some synchronization tools might be necessary as well. As you can see, there are some serious drawbacks in this pattern. It’s a huge amount of work in the first place, if you decide to implement all the above. You need to consider every aspect very carefully before you implement the object pool and evaluate whether it really is, what you need. * Static method for accessing class instance. * Part of Singleton design pattern. * Returns instance of Resource. * were used at the time of the request. * Return resource back to the pool. * attempts to use it. * @param object Resource instance. /* Resources will be reused. * Notice that the value of both resources were reset back to zero. Download the fully working example from github.
""" Some resource, that clients need to use. of this Resource class in my example.
""" Put resource back into default setting. """ Earlier this week, I posted an article about string generation for brute-force attacks and a couple of example solutions. I emphasized, that the key aspect of brute-force is speed. We want to try as many combinations of input data as possible in the minimum amount of time. And part of this is also efficient algorithm that will generate input combinations. But the examples I posted were written in Python, which is kind of a high level scripting language, not nearly as fast as C.
* to avoid restrictions on the generated string length. * each cycle and causes unnecessary slowdown. * size (20 characters are more than enough). /* Return new initialized charlist_t element. /* Free memory allocated by charlist. * @param list Pointer at the first element. /* Print the charlist_t data structure. * in the list including any '\0'. * @param list Input list of characters. /* Get next character sequence. * new character is added to the back of the list. * It's basicaly a number with base = 256. * @param list A pointer to charlist_t. Download the fully working code from github. Prototype is one of the easier to understand design patterns. The intent of prototype is to create new instances of classes by cloning a prototype instance, rather than building them from scratch. This is particularly useful when the initialization of the objects is very expensive and very similar among the majority of created instances. Take this for instance, you have some data stored on a remote server. You need them to initialize 1000 instances of some class during your program runtime. This data are static and very unlikely to be changed during the runtime of your application. You see, that downloading the data during initialization in constructor is pretty ineffective. Design like that would lead to exactly 999 pointless connections to the server and a lot of unnecessary network traffic, which is a gigantic waste of resources and time. If you use prototype instead, the application will download the data just once and the 1000 more instances will be cloned from the first one, saving us all the trouble. Client – creates a new object by asking a prototype to clone itself. Prototype – declares an interface for cloning itself. Concrete Prototype – implements the operation for cloning itself. You also need a place where all the prototypes will be stored. A good practice is using a factory class that will cover the initial prototype setup and will handle the cloning operations. This might remind you of the abstract factory design pattern. This is because they both are creational patterns and can be used to achieve the same behavior. The thing about prototype is that, you can dynamically change the prototype instance during the runtime and begin constructing something completely different with the same factory without sub-classing it. Another way of dynamic handling a lot of prototype instances is prototype manager. A class that stores a pool of prototypes and makes decisions on which one to instantiate based on some parameters. This is particularly useful when the amount of prototypes isn’t fixed. Now, let’s proceed to the code examples. I went with the first variant — a factory class for storing the prototypes. * Example of `prototype' design pattern.
""" Object, that can be cloned. of the classes from these prototypes. One of the essential tasks in software development is documenting your code. With no documentation, hardly anyone will be able to understand your code and therefore contribute to your project. Sometimes you might find even yourself looking at your own code wandering, “What the hell is this supposed to mean?” Well, that’s where documentation comes in! Good idea is to include documentation right into the source files. First of all, it helps coders read the source, because if they don’t get something, the documentation is right there! It’s much easier to maintain correct documentation. If you change something, you also change it 10 lines above in the documentation string. There are lots of utilities for analyzing source files and generating documentation from them. JavaDoc for Java, doxygen for C++ and Sphinx for Python. I assume you know the awesome-looking Python docs, right? Well, that documentation is generated by Sphinx! In this post I’ll try to explain how to get sphinx and most importantly how to get that sweet-looking documentation out of it :-). Easy install is a part of setuptools. So if this doesn’t run anything you probably need to install them. Look for package python-setuptools in your distribution’s repositary. Documentation is usualy placed in a separate folder in your project directory. It’s really up to you, but I recomend using doc/ folder. Then you need to setup basic files for sphinx in that particular folder (sphinx calls it a source directory). This can be done by sphinx-quickstart command that will guide you through the whole setup process. The important thing here is to answer yes to the question of enabling autodoc extension. This extension then collect the documentation from your code. The above mentioned sequence of commands should create a basic directory structure of your sphinx documentation. Somewhere in that structure (it depends on how did you answer to the questions of sphinx-quickstart) will be an index file of the whole docs. By default it will be called index.rst. Content of this file is in reStructured text. It’s a syntax for formating plain text documents. It’s not very hard to learn. Using either rst quick reference, sphinx guide or my personal favorite way — ripping off python docs. On every html page generated by sphinx is a link to the source rst file it were generated from. And so it is in the python docs. The link is at the bottom of the menu right above the search box. You see, the documentation of python is not only quite large, but also really well formed. So by looking at that you’ll be soon able to write some pretty good docs yourself. If you decide to crate a new page, you can simply add a file to the doc/ directory and sphinx will find it and include it into the documentation. Documentation from docs string isn’t included automatically like in doxygen. You need to specify where to include what. In-depth explanation on how to do that is here. Well, this was my very brief experience with sphinx. 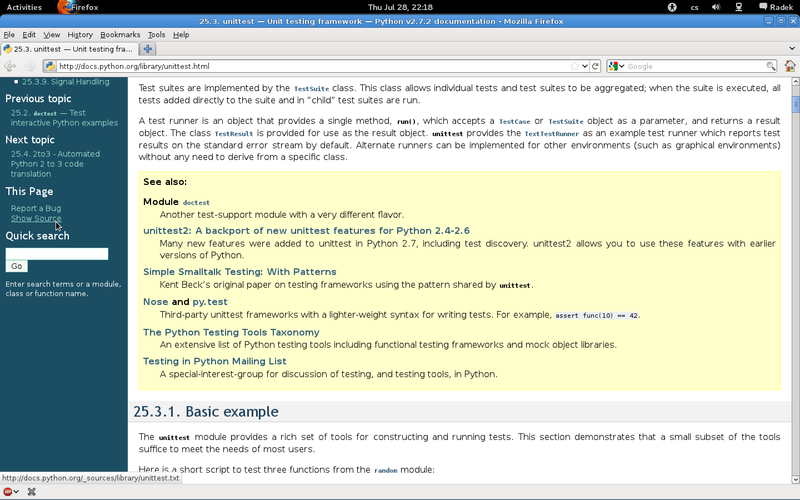 It’s a great tool for creating documentation for your python projects. Hopefully, I’ll get back to it at some point in the future and expand this article. One way to publish your software is by forfeiting your copyright a thereby releasing it into public domain. Anything that belongs to the public domain is without copyright. That means, that everybody can do anything they want with is. This might be useful for someone. The thing is, that by default, if you write a piece of software, you automatically become it’s copyright holder. This is stated in a thing called Berne Convention, which most of the countries have signed. So, in order to make your software public domain, you need to make clear, that you forfeit your copyright. Another great ways to distribute your software. Generally, there are two ways. Using an open source license or a free software license. What is the difference between these two? Well, there are two separate camps — OSI (Open Source Initiative) and FSF (Free Software Foundation). By making your project open source you allow others to “do whatever they want” with the sources (as long as you don’t violate the licensing terms). The open source is more practical. It gives the user a lot of freedom in copying and modifying the software. On the other hand, making your project a free software will allow users to “do whatever they want” (under the terms of the license) and if they modify the software, they have to publish the changes and give it back to the community. This makes the derivative works also publicly available. The free software is more philosophical. It wants to make sure, that the software once released as free will retain it’s freedoms. Here are some examples of popular and widely used licenses for your software. My personal favorite is GNU GPLv3.0. It’s a free software license, pretty restrictive about usage in proprietary software, but I like the philosophy behind it. It was initially written by this guy named Richard Stallman :-). The lesser version of this license (allowing linking in proprietary software) is GNU LGPL. Other popular ones are the BSD licenses. There are multiple variants of the BSD license. They are more open source, than free software. The MIT License is pretty straight-forward as well as permissive. Great comparison of various free software and open source licenses is available on Wikipedia.